If tasks were issued with an overlap more than 2, run aggregation of results. Toloka will process all performers' responses for the task and issue the resulting response and its confidence level. Click next to the Download results button. Aggregation takes from several minutes to several hours. Track the process on the Operations page. When aggregation is complete, download the TSV file with the results. Analyzes all performers' responses and returns the final response and its statistical significance. Note. Description of the David-Skin method. How do I add allowed values? Go to project editing and scroll to the Specifications section. Hover the mouse over the output data field and click . Fields with a set of values in the task interface. 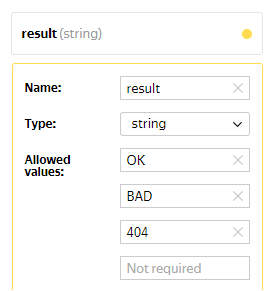 The result field has the string type. TSV file with aggregated responses contains fields CONFIDENCE: <field name output> - the response significance as a percentage. Aggregates responses based on the level of trust in the performer. The confidence level is determined by the performer's skill value. Choose the fields and the skill set in the dynamic overlap. You set a skill that defines the confidence level for the performer's responses. Correct responses in the control tasks. Responses that match the majority vote. The output data fields that you want to aggregate have allowed values. 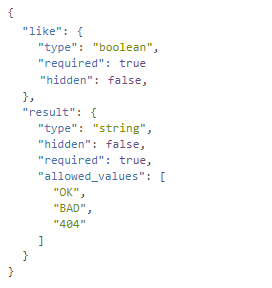 Strings and numbers with allowed values. Integers with minimum and maximum values. The gap between them can be up to 32. TSV file with aggregated responses contains fields CONFIDENCE: <output data field name> confidence in the aggregated response.